Aired: Apr 10, 1993 to ? This would be my second anime review on MAL. Nintama Rantarou was an anime that I have watched many times on my local-cable cartoons with lots of random episodes played on afternoon marathons. 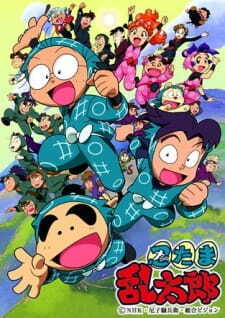 The cast of the trio consist of Rantarou, a regular ninja kid, Kirimaru, the pernicioust one, reacts to the sound of money being dropped and Shinbe, the fat kid. The story revolves around the trio doing mischief and sometimes being dragged into it. The artstyle of the show is pretty basic with being shounen show that kids watch on a Saturday morning. The sound quality is fair. I enjoyed it as a kid and pretty much now as it is very nostalgic and is kinda how I got into Japanese culture in the first place. Overall this is an okay anime that you would watch in your free time.